This is a stock 10' x 16' Cape Cod vinyl sided in Linen. The trim is white and the shutters have been upgraded to raised panel shutters in burgundy. The roof shingles are Williamsburg Slate. There are two windows 24"x 36" and pair of 12" x 12" end vents in Clay. There is a 6' double fiberglass door painted burgundy with a diamond plate sill. There is also a 3' single fiberglass door painted burgundy with 9-lite glass in the door and diamond plate sill. 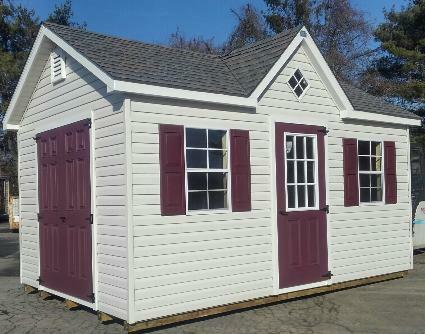 With all Cape Cod models there is a dormer in the roof with a window, painted rake and fascia, and gable overhangs on both ends.